This is going to be a short post for NaBloPoMo Day #18. I'm still dedicated to my commitment to post every day for the month of November, but the posts this week will most likely be about the various San Diego Bay Wine & Food Festival events I'll be attending and photographing. Although I had the time to cook yesterday, I wanted something relatively simple. 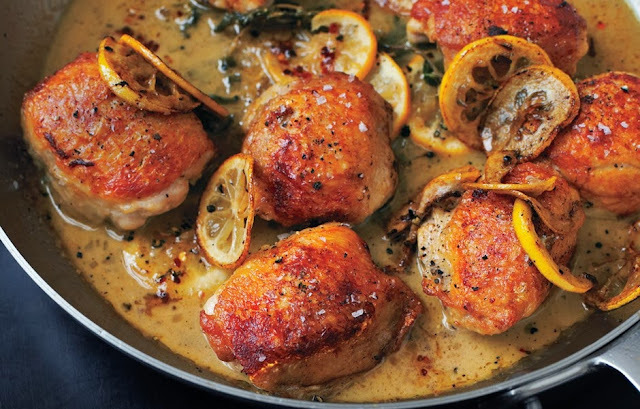 When Bon Appetit's Roasted Chicken Thighs with Lemon and Oregano appeared in my Facebook newsfeed, my decision was made. 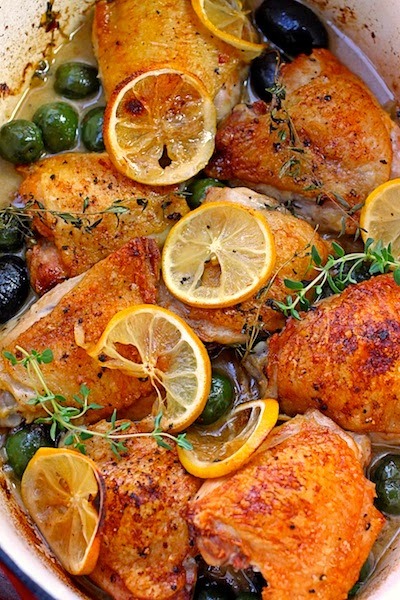 The enticing photo did its job - it made me want to prepare the recipe so I could taste those crisp, plump, juicy, and golden brown chicken thighs. The fact that the chicken was photographed in the pan, right out of the oven, also portrayed casual and comforting and looked amazing with the caramelized lemon slices and luscious garlicky, white wine pan sauce. I obviously wanted my chicken to come out looking like the photograph, but became disillusioned after reading the mixed reviews in the comments section. Most complained the cooking time was too short to cook the chicken properly; some said the skin never crisped up with the chicken remaining skin side down in the pan with the sauce; and others were disappointed in the flavor. After taking the reviews into account, and reading a few more similar recipes, I adapted the ingredients and preparation/cooking slightly. My dish ended up to be a combination of Bon Appetit's crispy chicken thighs with lemon and oregano and Thomas Keller's Ad Hoc at Home crispy braised chicken thighs. Take a look at both recipes and pull what you prefer out of each to make your own version. My store didn't have skin-on, boneless thighs, only skin-on, bone-in thighs. They were medium-sized and I bought eight. I heated a few tablespoons of canola oil in a large dutch oven and made sure my pan and oil was hot, but not smoking, before adding the seasoned chicken thighs skin side down. I browned the thighs over medium-high heat for about 5 minutes and then turned them over and cooked for 2 minutes more. I transferred the chicken to a plate, turned the heat down to medium, and sauteed the shallots, garlic, and red pepper flakes for about 3 minutes. I added the white wine and simmered for about 2 minutes to burn off the alcohol. I added some Italian green olives, 8 fresh thyme sprigs (instead of oregano), and 1 cup of chicken broth. I brought the sauce back up to a simmer, returned the chicken to the pan and scattered the lemon slices over the chicken. I put the pan, uncovered, in a 375 degree oven for an additional 25 minutes. Finally, I followed Thomas Keller's method of crisping up the chicken even more by putting the pan under the broiler for a minute or two. This also helped to caramelize the lemon slices a bit more. I served with Near East Garlic & Olive Oil Couscous and steamed broccoli. IMHO your photo looks even more appetizing than the one from Bon Appetit! Keep up the good work, I enjoy reading your Blog. Good choice going with the skin-on bone-in thighs. They are much more flavorful than boneless ones. I am going to make this tonight! I just can't resist after seeing your photograph. I'm definitely drooling more than Trapper after reading this. "the skin never crisped up with the chicken remaining skin side down in the pan with the sauce"
The reviewers who said this obviously did the recipe wrong. The recipe calls for adding the sauce AFTER the chicken has been removed to a plate to keep warm. I think I'll try the Bon Appetit recipe as written.